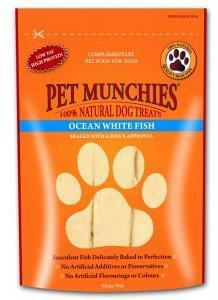 Details: 8 packets of Pet Munchies Ocean White Fish Strips 100g are 100% natural made from the finest quality White fish meat. These exceptional treats have the natural textures, flavours and palatability that dogs love. 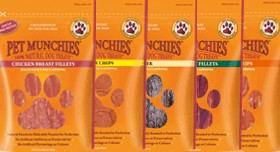 Pet Munchies are Superb Quality, Pet treats made of real meat. All of our interesting treats are natural hand cuts that preserve the flavours of the finest chicken and duck. Our products are made from 100% chicken, duck and beef liver that will enhance the quality of life of your pet. Delicious, Nutritious and Wholesome… all made 100% Natural just like nature made them, with natural textures, flavours and exceptional palatability dogs love. Today's consumers are demanding natural healthy products for their pets. And that's what you'll get with a Pet Munchies - the brand you can trust. Our products are naturally low in fat & carbohydrates, high in protein and very nutritious. Delicately roasted to perfection to ensure quality and flavour. No artificial preservatives, flavourings colourings or additives are in our products. Plus, they are the perfect size and texture for any dog and cats love em too! Just break into smaller pieces for toy breed dogs and cats. Even our Senior dogs with tender gums can enjoy these treats. We know dog treats are both healthier and tastier if they're made from pure, natural ingredients without additives or added sugar. So that’s exactly how we make our treats. And that’s what makes them completely different from other treats. What’s more, dogs love the way they taste. It’s all down to the ingredients. Every one of our products are –Sealed with a Dogs Approval-.